Abstract：Branched-chain fatty acids (BCFA) mainly include mono-branched-chain fatty acids and multi-branched-chain fatty acids, which are found in human skin and secretions, microbial cell membranes, and dairy products and meat products. Recent studies have shown that branched-chain fatty acids have potential inhibitory effects on cancer cells such as breast cancer cells, prostate cancer cells and bladder cancer cells. In addition, branched-chain fatty acids also have anti-inflammatory effects such as inhibition of neonatal necrotizing enterocolitis. Further analysis of branched-chain fatty acids in various foods and tissues of human body, and in-depth study on the structural function and mechanism of branched-chain fatty acids are important directions for the study of branched-chain fatty acids. Key words：branched-chain fatty acid; fatty acid; breast milk fat; neonatal necrotizing enterocolitis. \[1\] KANEDA T. Iso-and anteiso-fatty acids in bacteria: biosynthesis, function, and taxonomic significance\[J\]. Microbiol Rev, 1991, 55(2): 288. \[2\] MUKHERJI M, SCHOFIELD C J, WIERZBICKI A S, et al. The chemical biology of branched-chain lipid metabolism\[J\]. Prog Lipid Res, 2003, 42(5): 359-376. \[3\] LINDSTR M F, THURNHOFER S, VETTER W, et al. Impact on lipid membrane organization by free branched-chain fatty acids\[J\]. Phys Chem Chem Phys, 2006, 8(41): 4792-4797. \[4\] INSULL W, Jr, AHRENS E H, Jr. The fatty acids of human milk from mothers on diets taken ad libitum\[J\]. Biochem J, 1959, 72(1): 27. \[5\] 程文明, 杨柏珍, 李俊. 文冠果果壳中脂肪酸成分的研究\[J\]. 安徽医药, 2002, 6(4): 5-6. \[6\] YAN Y, WANG Z, WANG X, et al. Branched chain fatty acids positional distribution in human milk fat and common human food fats and uptake in human intestinal cells\[J\]. J Funct Foods, 2017, 29:172-177. \[7\] MASSART-LE N A M, POOTER H D, DECLOEDT M, et al. Composition and variability of the branched-chain fatty acid fraction in the milk of goats and cows\[J\]. Lipids, 1981, 16(5): 286-292. \[8\] RANRESSLER R R, SIM D, O'DonNELLMEGARO A M, et al. Branched chain fatty acid content of United States retail cows milk and implications for dietary intake\[J\]. Lipids, 2011, 46(7): 569-576. \[9\] 马露. 奶牛、水牛、牦牛、娟珊牛、山羊、骆驼和马乳特征性成分分析 \[D\]. 呼和浩特:内蒙古农业大学, 2014. \[11\] YAN Y, WANG X, LIU Y, et al. Combined urea-thin layer chromatography and silver nitrate-thin layer chromatography for micro separation and determination of hard-to-detect branched chain fatty acids in natural lipids\[J\]. J Chromatogr A, 2015, 1425:293-301. \[12\] VLAEMINCK B, LOUREN O M, BRUINENBERG M, et al. Odd and branched chain fatty acids in rumen contents and milk of dairy cows fed forages from semi-natural grasslands\[J\]. Commun Agric Appl Biol Sci, 2004, 69(2): 337. \[13\] WANG D H, JACKSON J R, TWINING C, et al. Saturated branched chain, normal odd-carbon-numbered, and n-3 (omega-3) polyunsaturated fatty acids in freshwater fish in the northeastern United States\[J\]. J Agric Food Chem, 2016, 64(40): 7512-7519. \[14\] EMMANUEL B, MILLIGAN L P, TURNER B V. The metabolism of acetate by rumen microorganisms\[J\]. Can J Microbiol, 1974, 20(2): 183-185. \[15\] 杨舒黎, 胡志勇, 王加启. 奶牛瘤胃脂肪酸代谢研究进展\[J\]. 中国奶牛, 2007(3): 14-18. \[16\] 金磊, 王立志, 王之盛, 等. 瘤胃微生物与反刍动物产品脂肪酸组成的关系\[J\]. 饲料工业, 2018,39(9): 51-55. \[17\] VLAEMINCK B, FIEVEZ V, TAMMINGA S, et al. Milk odd- and branched-chain fatty acids in relation to the rumen fermentation pattern\[J\]. J Dairy Sci, 2006, 89(10): 3954-3964. \[18\] RAN-RESSLER R R, LUDMILA K, ARGANBRIGHT K M, et al. Branched chain fatty acids reduce the incidence of necrotizing wnterocolitis and alter gastrointestinal microbial ecology in a neonatal rat model\[J\]. Plos One, 2011, 6(12): 29-32. \[19\] EGGE H, MURAWSKI U, RYHAGE R, et al. Minor constituents of human milk. IV. Analysis of the branched chain fatty acids\[J\]. Chem Phys Lipids, 1972, 8(1): 42-55. \[20\] CLAUD E C, WALKER W A. Hypothesis: inappropriate colonization of the premature intestine can cause neonatal necrotizing enterocolitis\[J\]. Faseb J, 2001, 15(8): 1398-1403. \[21\] GIBSON R A, KNEEBONE G M. Effect of sampling on fatty acid composition of human colostrum\[J\]. J Nutr, 1980, 110(8): 1671. \[22\] IDOTA T. The latest survey for the composition of human milk obtained from Japanese mothers. Part II. Changes of fatty acid composition, phospholipid and cholesterol contents during lactation\[J\]. J Pediatr Gastr Nutr, 1991, 5(1): 159-173. \[23\] JIE L, QI C, SUN J, et al. The impact of lactation and gestational age on the composition of branched-chain fatty acids in human breast milk\[J\]. Food Funct, 2018, 9:1747-1754. \[24\] DINGESS K A, VALENTINE C J, OLLBERDING N J, et al. Branched-chain fatty acid composition of human milk and the impact of maternal diet: the global exploration of human milk (GEHM) study\[J\]. Am J Clin Nutr, 2016, 105(1): 177. \[25\] RISSMANN R, GROENINK H W W, WEERHEIM A M, et al. New insights into ultrastructure, lipid composition and organization of vernix caseosa\[J\]. J Invest Dermatol, 2006, 126(8): 1823-1833. \[26\] MIKOVA R, VRKOSLAV V, HANUS R, et al. Newborn boys and girls differ in the lipid composition of vernix caseosa\[J\]. Plos One, 2014, 9(6): 99-173. \[27\] RAN-RESSLER R, DEVAPATLA S P, BRENNA J. Branched chain fatty acids are constituents of the normal healthy newborn gastrointestinal tract\[J\]. Pediatr Res, 2008, 64(64): 605-609. \[28\] 揭良, 齐策, 余仁强. 胎脂和羊毛脂中支链脂肪酸组成的研究\[J\]. 中国油脂, 2018,43(7): 27-31. \[29\] TERASAKA D, CLARK D A, SINGH B N, et al. Free fatty acids of human meconium\[J\]. Biol Neonate, 1986, 50(1): 16-20. \[30\] HOATH S B, PICKENS W L, VISSCHER M O. The biology of vernix caseosa\[J\]. Int J Commetic Sci , 2010, 28(5): 319-333. \[31\] YANG Z, LIU S, CHEN X, et al. Induction of apoptotic cell death and in vivo growth inhibition of human cancer cells by a saturated branched-chain fatty acid,13-methyltetradecanoic acid\[J\]. Cancer Res, 2000, 60(3):505-509. \[32\] WonGTANGTINTHARN S, OKU H, IWASAKI H, et al. Effect of branched-chain fatty acids on fatty acid biosynthesis of human breast cancer cells\[J\]. J Nutr Sci Vitaminol, 2004, 50(2): 137-143. \[33\] WonGTANGTINTHARN S, OKU H, IWASAKI H, et al. Incorporation of branched-chain fatty acid into cellular lipids and caspase-independent apoptosis in human breast cancer cell line, SKBR-3\[J\]. Lipids Health Dis,2005, 29(4). \[34\] YANG P, COLLIN P, MADDEN T, et al. Inhibition of proliferation of PC3 cells by the branched-chain fatty acid, 12-methyltetradecanoic acid, is associated with inhibition of 5-lipoxygenase\[J\]. Prostate, 2003, 55(4): 281. \[35\] LIN T, YIN X, CAI Q, et al. 13-Methyltetradecanoic acid induces mitochondrial-mediated apoptosis in human bladder cancer cells\[J\]. Urol Oncol-Semin Ori, 2012, 30(3): 339-345. \[36\] WRIGHT K C, YANG P, VAN PELT C S, et al. 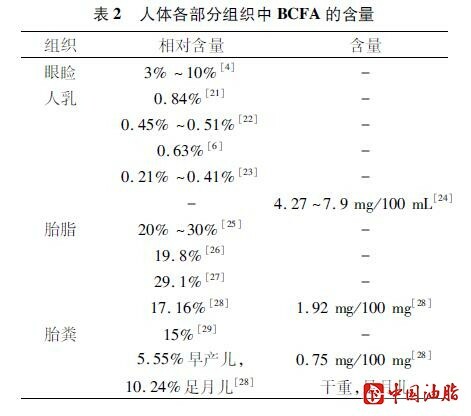 evaluation of targeted arterial delivery of the branched chain fatty acid 12-methyltetradecanoic acid as a novel therapy for solid tumors\[J\]. J Exp Ther Oncol, 2005, 5(1): 55-68. \[37\] YU J, YANG L, WU Y, et al. 13-Methyltetradecanoic acid mitigates cerebral ischemia/reperfusion injury\[J\]. NRR, 2016, 11(9): 1431-1437. \[38\] YAN Y, WANG Z, GREENWALD J, et al. BCFA suppresses LPS induced IL-8 mRNA expression in human intestinal epithelial cells\[J\]. Prostag Leukotr Ess, 2017, 116:27-31. \[39\] SHYI-TING F, CHIU L, CHENG-TEH W. Platelet lysis and functional perturbation by 13-methyl myristate. The major fatty acid in Flavobacterium ranacida\[J\]. Thromb Res, 1996, 81(1): 91. \[40\] 余涓, 胡桂芳, 翁绳美. 13-MTD对氧反常诱导的SH-SY5Y神经细胞损伤的影响\[J\]. 神经解剖学杂志, 2010, 26(4): 347-352. \[41\] 余涓, 胡桂芳, 翁绳美. 13-甲基十四烷酸对氧反常诱导大鼠胚脑皮质神经元凋亡和形态学损伤的保护作用\[J\]. 解剖学报, 2015, 46(1): 25-31. \[42\] 何宏星, 翁绳美, 胡潇. 13-甲基十四烷酸对大鼠局灶性缺血脑组织的保护作用\[J\]. 福建医科大学学报, 2018, 52(2): 80-84.